The Trident Amateur Radio Club has a small swap meet/tail gate every year that usually has a handful of people with stuff to sell. It’s not huge, but it’s a nice little gathering and an opportunity to meet up with other hams that I don’t get to see often. This year’s tail gate gathering was this morning. I usually go more for the hanging out aspect than to find stuff to bring home, but this year I managed to find a few things to bring home with me. 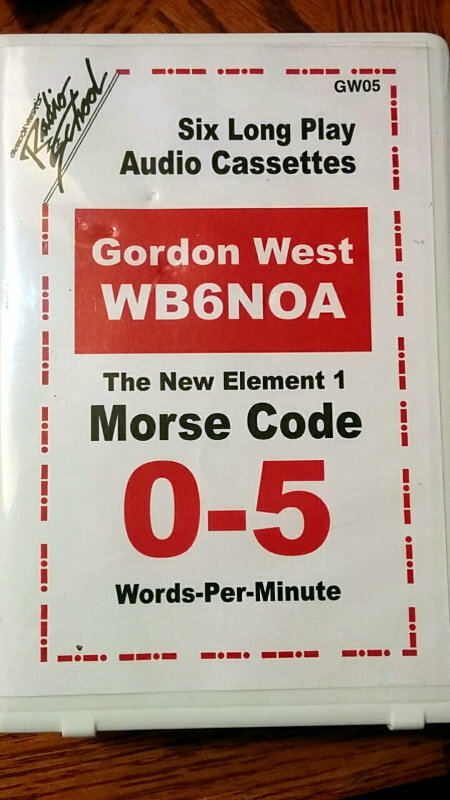 One of the older hams was giving away a bunch of his older amateur radio books, and being a sucker for old vintage books, managed to get a few of them. A 1979 ARRL handbook, an old ARRL antenna book (from 1958 or so I think), an ARRL Radio Fundamentals book from 1972 and a 1959 Rapid Radio Repair book were the ones I grabbed. He also had an old US Navy AN/URM-26B signal generator in a big heavy duty looking case that still worked (according to the sticky note he put on it anyway), so I bought that from him too. $10 for what looks like a neat piece of equipment (even if it doesn’t work) seemed like a pretty good deal. I’ll wait to check it out once we’re settled in the new house. 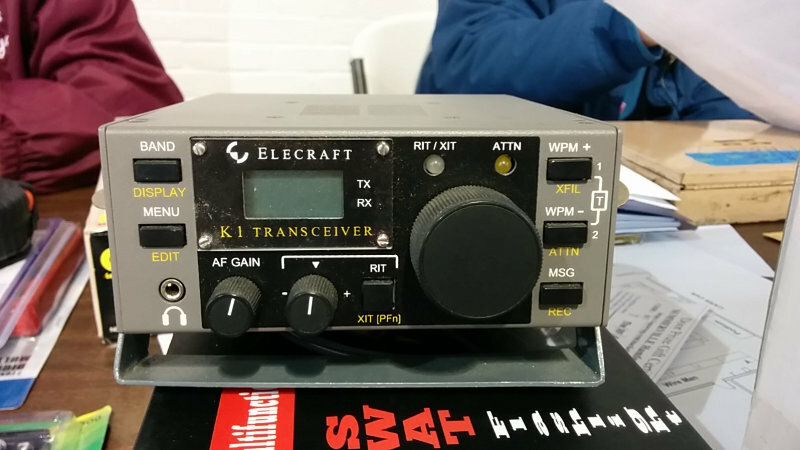 The last couple of items I grabbed were off Tom/W4DAX’s table, an MFJ SWR/watt meter and a dead power supply that he didn’t have time to fix up. The SWR meter will be useful in the shack, and the power supply will be a nice project to work on once I get the bench back in operation. 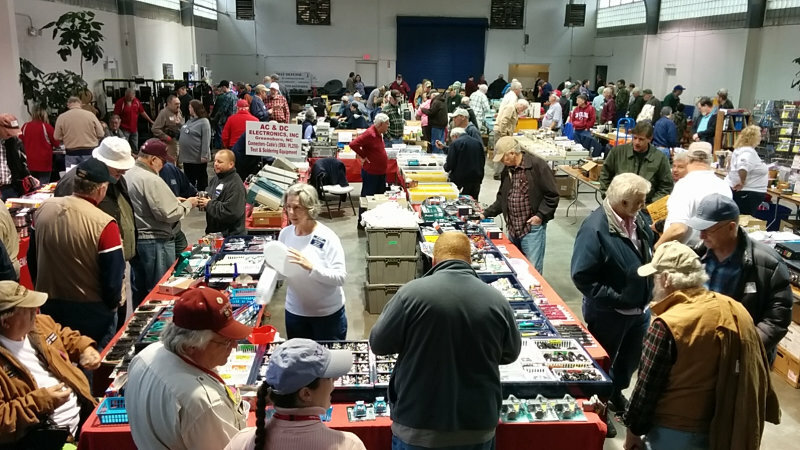 Had another good time at the Charleston Hamfest today. There were a lot more vendors (including in the tailgate area) this year than last year. The day got off to a bit of a cool and frosty start, but warmed up nicely. Good sized crowd of people attending the hamfest. Here are the early birds. Even shortly after 8 there were a fair number of people browsing around the tables. 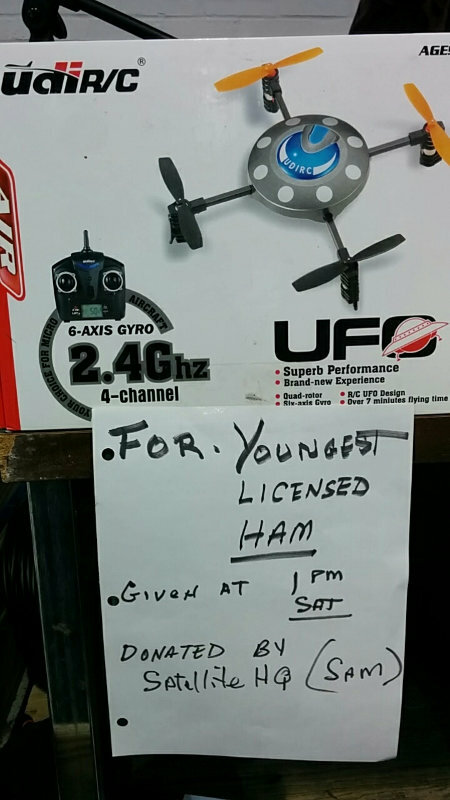 Early hamfesters at the 2015 Charleston Hamfest. Started off the day picking up a couple of items off the Free Stuff table: a 1971 edition of the Radio Amateur’s Handbook, and a CueCat. I’m looking forward to going through the 1971 handbook. I think it will be cool to see what amateur radio was like when I was 1 year old. I remember CueCats from my Apple //e days and always thought it would be cool to have one. Should be fun to play with this. Browsing around the hamfest, I picked up an Ethernet shield, a big bag of resistors and some perfboard to mess around with. The Ethernet shield will fit in nicely with the growing collection. A big bag of 1/4 watt 1% tolerance resistors. I should be set for resistors for a good long time. 2 large plain perfboards, and 8 prototyping boards with solder pads. I like using the perfboard for quick prototyping and experimenting with circuits. I was also able to find most of the things I’ll need to build a window pass-thru block for the antenna. 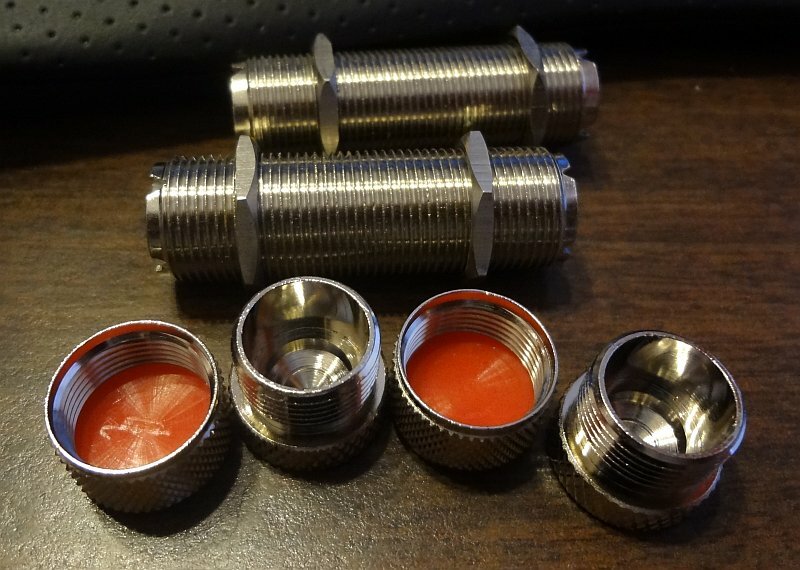 Two 3 inch SO-239 bulkhead connectors and some screw-on caps for the cable ends. There were a lot of other things I wish I could have picked up too (isn’t that always the case? ), but I’m pretty pleased with what I got today. To top things off, I won one of the door prizes being given out too, a $50 ARRL gift certificate. Not sure what I’ll get with it, but it will be something good. 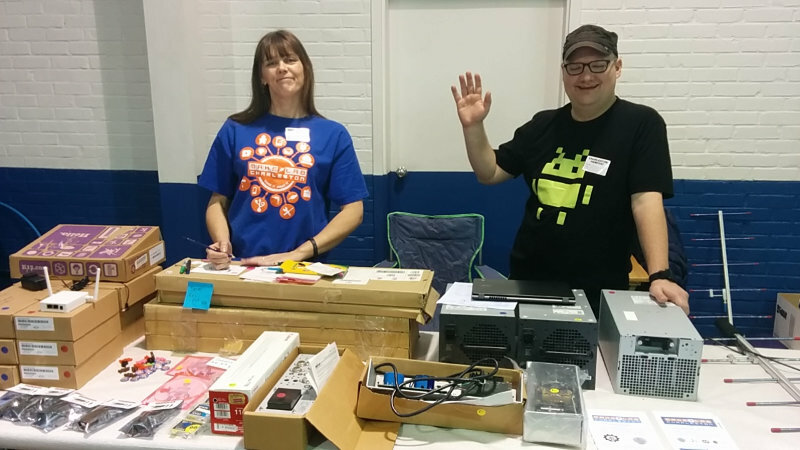 The VE testing session at the hamfest went very well. There were 16 people taking tests today, 9 of whom were taking the Tech (Element 2) test. Everybody left with either a new license or an upgrade, so very successful on all accounts.